Where can hip everyday trend-conscious moms find the same exclusive customized baby products and services as their favorite celebs??? Baby Celebration LA of course! Baby Celebration LA is about to be delivered to the Los Angeles Convention Center April 28th-29th, 2007. You’ll be able to choose the most luxurious earth-friendly organic clothing styles from Wooly Lamb Organics like your favorite stars from ‘Heroes” or introduce your baby to the softest animal friends and blankets in the world made by Moncalin like Carnie Wilson’s baby or slip your infant into a comfy pair of Swaddlebees that were on everyone’s must have list. Exhilarating speakers, innovative designs, exquisite exhibitors and more will be waiting to meet you at Baby Celebration LA. 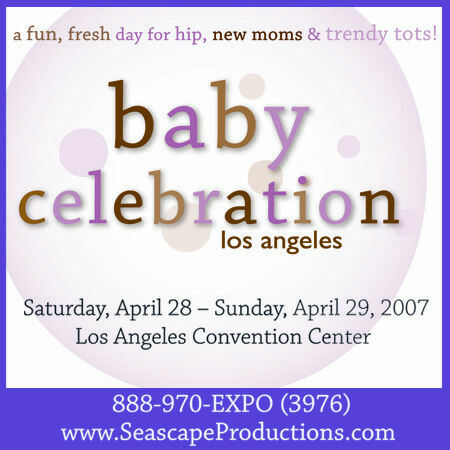 This Belly Scoop has been sponsored by Seascape Productions.. the wonderful people who are putting together Baby Celebration LA...THE Expo of '2007!